Diners are often a big disappointment. Flat omelets, greasy potatoes, weak coffee, or slow service are common with many Diners, and the gems are not in my local area. So every once and awhile I will make diner food at home. For breakfast, that means potatoes with omelets. I can make the potatoes easily if I start when the kids are still asleep. This is also a great recipe if you have potatoes that are starting to go bad. Slice onion into strips and saute in a large frying pan. Cut potatoes into medium sized cubes (see photo) and add to the pan. Saute for 15 minutes flipping every couple of minutes and adding salt every five minutes. Add garlic and herbs until well covered and saute another 5 minute. Serve with omelet or scrambled eggs. Here is a very versatile kale recipes. This one marries sweet and a little spice and was a hit at my department's summer picnic. Get the charcoal or gas grill going medium or even low. 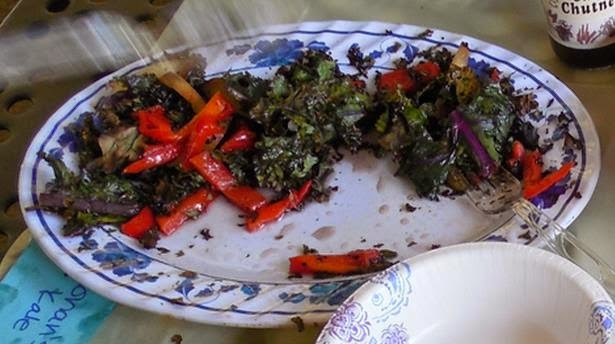 Leave the kale whole and spread about a quarter cup of olive oil on the kale leaves. Then put on the grill along with the red pepper. Turn the kale and pepper every couple of minutes. The red pepper is done when there is good char on all sides, then take off the grill and put into a sealed plastic bag to steam. When the kale looks wet green, is wilted in most areas and charred at the ends, about 10 minutes take off and let sit on the cutting board. Make the dressing with the olive oil, honey, lime, chili flakes, and salt. Don't ask me quantities, I wing it and hope you have some skill in making a dressing. This recipe is about balance - sweet from the honey, spice from the chili flakes, and sour from the lime. Color balance from the green kale, red peppers, and purple/yellow plums. Reminds me of my post on how to get teams to think agile. It requires diversity - both in skills, thinking, and ethnicity to achieve collaboration and drive innovation. I already have a blog, Social, Agile, and Transformation. Why another blog? I was one of the founders of TripConnect, a social network for people who wanted to share travel advice with friends and people with similar interests. It was a great site and a lot of fun. I enjoyed sharing reviews with other family and foodie travelers. I miss that business and sharing some of my experiences on travel, cooking, and life in general. So today, about a year after we shut down the site and sold off some of the assets, I've decided to start a new blog where I can share my experiences. Ahh, but not just experiences... Since this is CIO recipes, I promise to include in each post some advice to technologists. And not just my experiences. If you want to contribute to the site, let me know by connecting with me, nyike on Twitter and letting me know. All I ask is that you share either a food, travel, or life experience, that you include some advice to technologists, that you post a photo, and that you agree to make several contributions over a three month period.